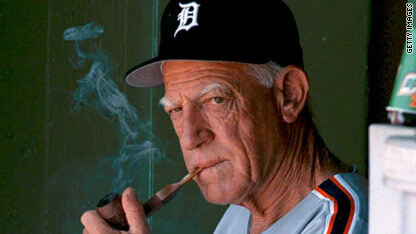 Growing up as a Tigers fan in Detroit, Sparky Anderson was the quintessential baseball manager. With his shocking white hair and humble leadership, Sparky was a Moses-like figure to me. While I'm not the most superstitious person, I have always taken a little hop over the white chalked foul lines on baseball diamonds because that's what I saw Sparky do back when I was in grade school. Being at the fifth and final game of the 1984 World Series at Tiger Stadium when I was in third grade is etched in my memory and I have Sparky to thank for leading his team there. May the memory of George "Sparky" Anderson forever be a blessing for his family, for Major League Baseball, and for the people of Detroit. ‎"People who live in the past generally are afraid to compete in the present. I've got my faults, but living in the past is not one of them. There's no future in it."